I’m doing it — why not you, too? 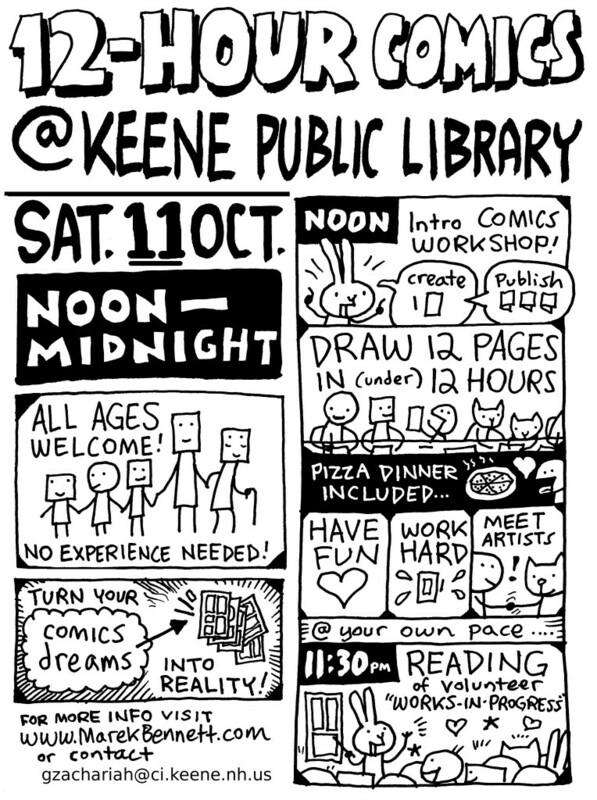 Make a twelve-page comic in twelve hours on October 11 at Keene Public Library! We’ll begin […] at noon with a brief COMICS WORKSHOP crash-course in comics creation and self-publishing from N.H. cartoonist Marek Bennett. Then we’ll dive in and draw for the next half-day, pausing for a pizza party dinner and a reading of our work as midnight approaches. Whether you bring an existing art project or start a completely new one, the time limit and group dynamics will help you find, nurture, and grow that sweet spot of inspiration, improvisation, and concentration. All ages welcome! No experience needed! Work hard! Have fun! Meet artists!